Before I connect this necklace to my chosen title, let me tell you how I choose titles for my necklaces…and why I choose titles. Oops. A commitment. Good reply, it turns out. I started at the dining room table in Hong Kong and liked what I did. I had fabulous beads. Still do. So I made some decisions: this is my business; it’s appropriate to make a profit so I can keep buying beads without guilt; I’m now an artist; therefore I treat my work like a painting (Important insight. I had plexiglass boxes made so I can hang my works like two-dimensional art.) Also, I titled my work. Whew, took two paragraphs to answer that one. How I choose titles. When we returned to Menlo Park from Hong Kong, while reading the NYTimes Book Review, I started underlining catchy phrases. Mind you, only an English major wants to memorialize catchy phrases. Then I listed them on notepaper. I did this for less than a year. I just went to my studio to count the pages–23. I still use them and have never expanded the lists. When I finish a necklace, I prepare a tag. First is the title. The feeling of the necklace is fresh in my mind as I review the lists and a title that corresponds jumps at me. It’s totally intuitive. So simple. Back to the nightingale and the necklace. I recently named this necklace and when I started writing today, discovered how an intuitive pick from my long list of titles was the correct karmic choice. There is a Ukraine legend that a nightingale flew to Ukraine from India and heard only sad songs, so it sang its song to cheer them up. The people responded with happy songs, and since then, nightingales visit Ukraine each spring to hear happy folk songs. This was my spring necklace, created in the winter, correctly, if surprisingly, so named for spring. Full circle. Details: it is 20.5” long accompanied by earrings that are 1.5” long. $119 the set. 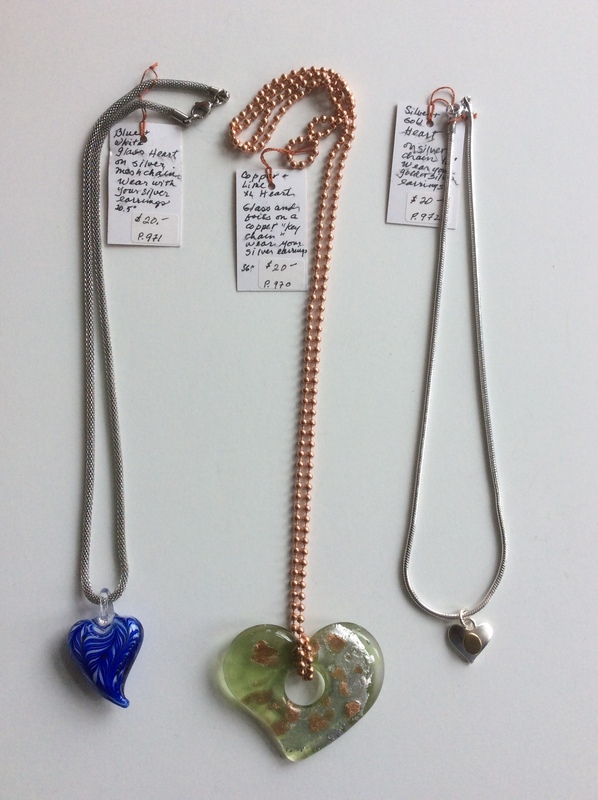 The necklace features a lampwork glass heart by Louise Erskine (MA) and two large Venetian blown glass beads. 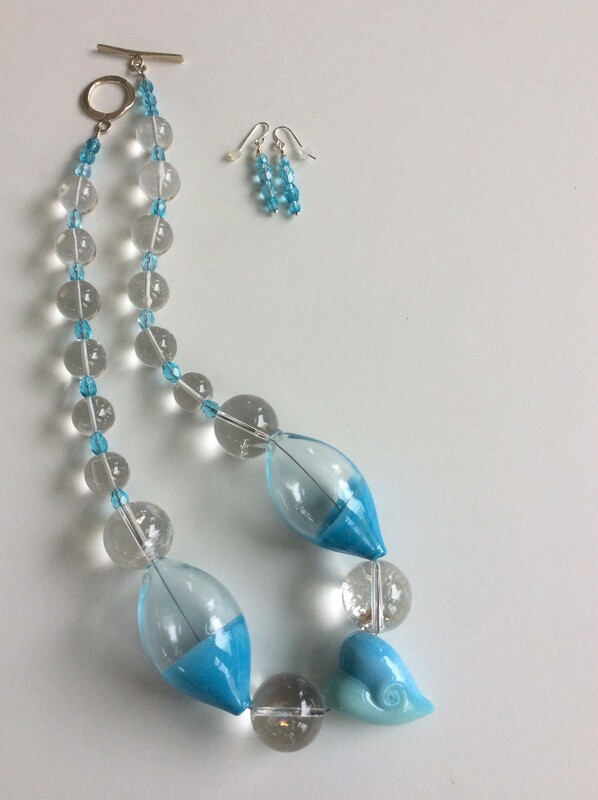 The remaining beads are rock crystal and faceted glass crystals. I love how the aqua of the crystals refracts through the clear beads. Sterling silver clasp. Max will turn one year on April 12. I shall post a birthday salute! This necklace draws attention coming and going. I strive to make all my designs attractive from the front, but it is only a few necklaces that can achieve that high mark from the back. This is one. These paper beads were made by an unknown artist in Murano, Italy. I bought them on a trip there four years ago. They look like corrugated paper sliced in ribbons and crafted into architectural shapes…to my mind. What a labor of love! They are treated with a matte varnish to protect the surface. They are very sturdy. 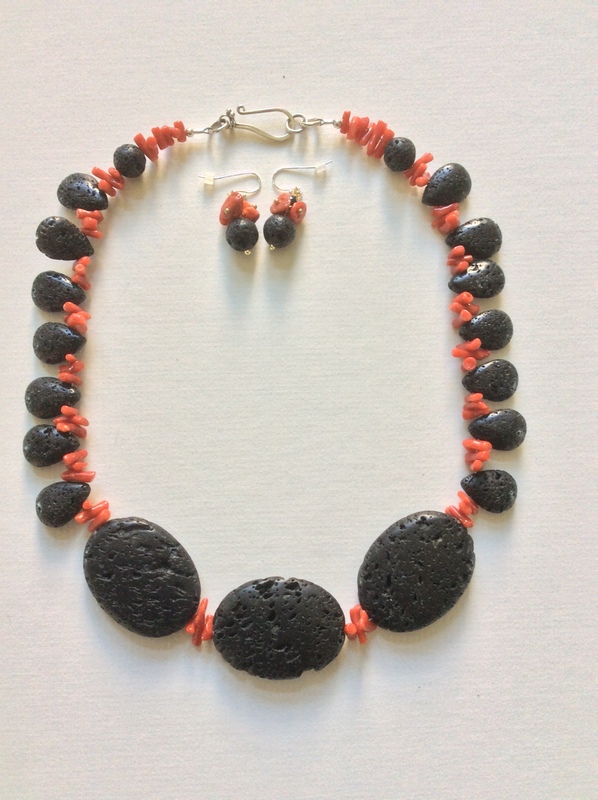 I wanted them to be paired with special beads, both texture- and color-wise. For that honor, I found a dozen handmade glass beads from the tiny shop in Carmel, CA, called Two Sisters. The remaining spacer beads are pale wood. The creative clasp is a resin circle in pale beige coupled with a wood toggle featuring four different woods. 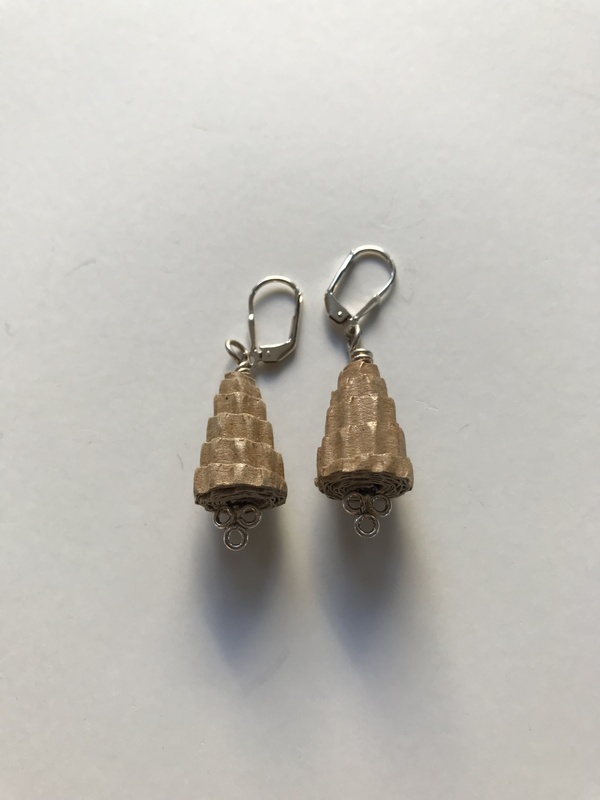 Matching earrings of the stylized paper and sterling silver are 1.75” long. The necklace is 21” long. I remember when I was first introduced to American Sleeping Beauty Turquoise at one of my beloved bead shows in Northern California. Whether it was Oakland or Santa Barbara; what the exact date was; I have no recall. I saw the clarity of a robin blue strand of really big faceted turquoise beads, and just like the first Tiffany boxed gift you receive, you are transfixed by the color and you know you are in the presence of something iconic. The strand was expensive ($39 per bead), but I intuitively knew it was worth it. And guess what? I never saw turquoise from the American Beauty mine in Globe, Arizona, again. After my research for this blog, I know why: the mine closed in 2012*. Close-up of the front of the centerpiece showing artistic use of boring ole electroplate. There are two pieces: the flower shape on top and the rectangle of dyed magnesite on the bottom. Turquoise mines in that area date back to the Anasazi era (200 BC to AD1500) of Native Americans. The Navajos mined it into the 1900s. 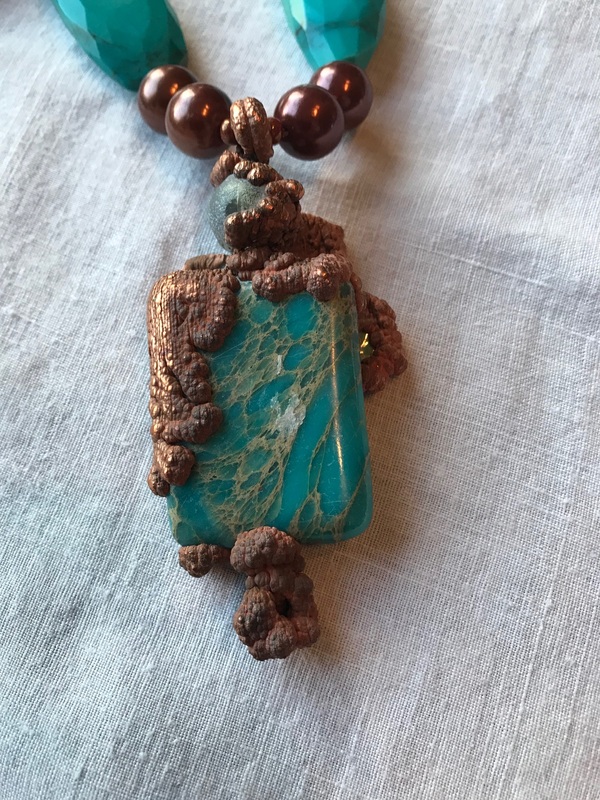 An American entrepreneur took it over in the ‘60s and closed it in 2012 to mine copper.What made this necklace possible was my discovery of the creative centerpiece at my favorite Boston area bead show this past October. Currently it is the only show I attend since I am well-stocked after 24 years in this endeavor! But like all acquirers, I can’t stop looking! And buying…. The vendor didn’t tell me the name of the designer even though I asked, so I can’t give credit. I have two more to use later. Can you see me smiling? What attracted me to this centerpiece was the creative use of copper electroplate, usually seen as smooth and sleek. This inspired artist made it to the consistency of mashed potatoes and just piled it on, with a few balls of pure copper accenting the bumps. 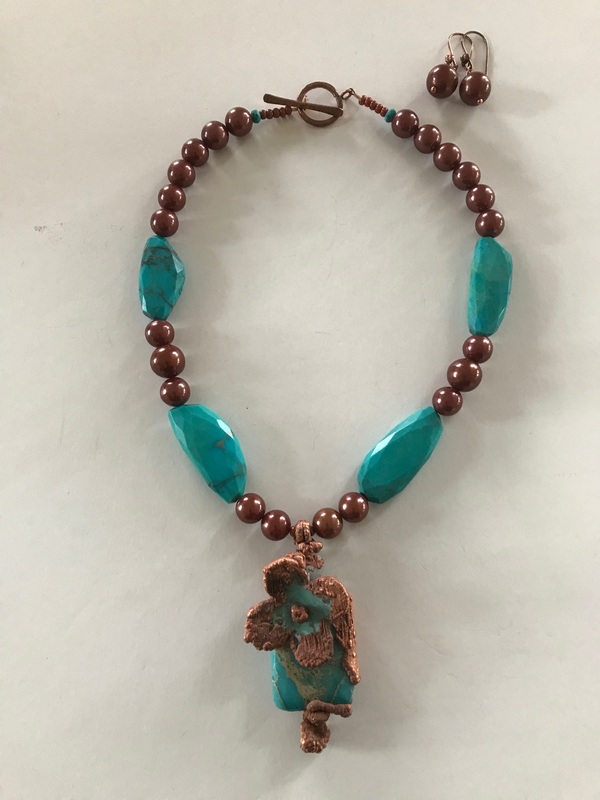 S/he picked dyed magnesite (often confused as turquoise, and, worse, often claimed as turquoise by unscrupulous vendors), then cleverly added a “flower” in the spirit of more is better. There is even more: the top bead of frosted rock crystal is artistically embellished, crowned by a generous circle to attach to a necklace. 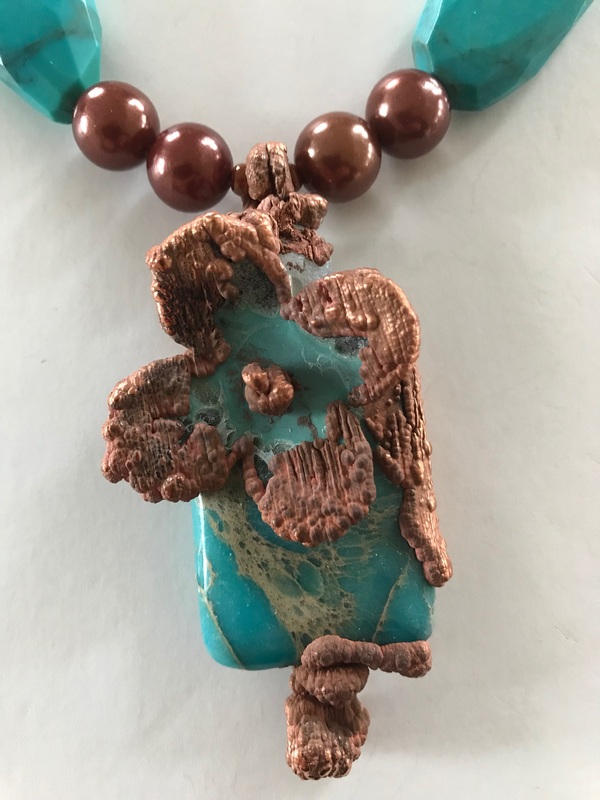 electroplated copper on dyed magnesite. The third component to this magnificent piece (forgive my abandonment of humility) are the Swarovski pearls which the world-famous crystal producer made by using a crystal instead of the usual shell irritant, resulting in faux pearls in a myriad of colors! So this necklace is the classic high/low I often see in home design magazines. They are reasonably priced, but a quality pearl: the low to the above two highs. Now for the summary: this American Beauty Turquoise necklace is 20” plus a 3” long centerpiece. $259.00 including earrings. *Not to say American Beauty Turquoise cannot be found. Many people, especially the miners, have stashes of it. Prices have increased, as they do for all scarce commodities. Multi-Strand Woven Necklace with Agate. Puppy update. 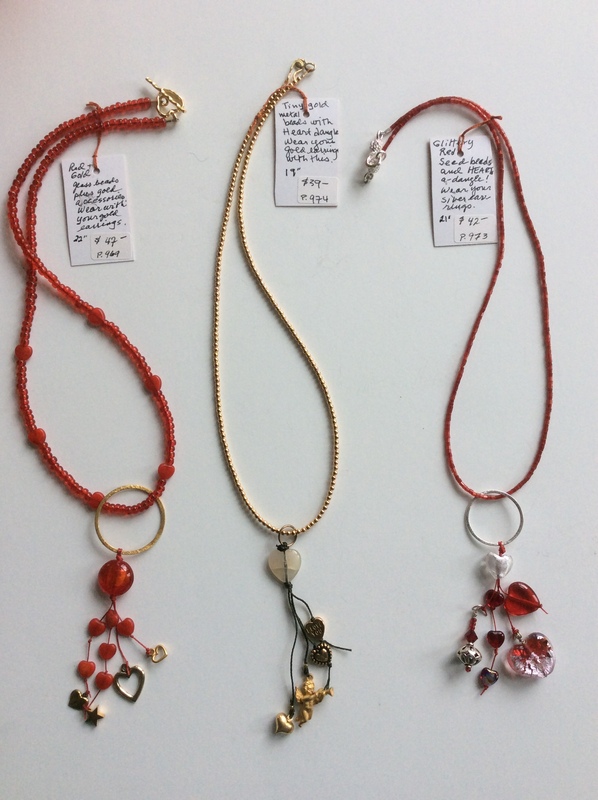 This necklace has many fascinating beads with too many stories, so I shall focus only on the amazing agate stone centerpiece which has two sides and two personalities. I will list all the beads for my readers’ information. Agate really is just a stone living in volcanic host rocks discovered in the third century on the shore of a river in Sicily…think Mt. Etna. Most agates are hollow and in the form of a geode. Slices like this one are cut from the outside of the geode; the inside is called drusy quartz. This agate is probably Brazilian identified by its brown color interlaced with white and gray with striking layered bands. This is high end agate; ordinary agate is found as gravel in streams. 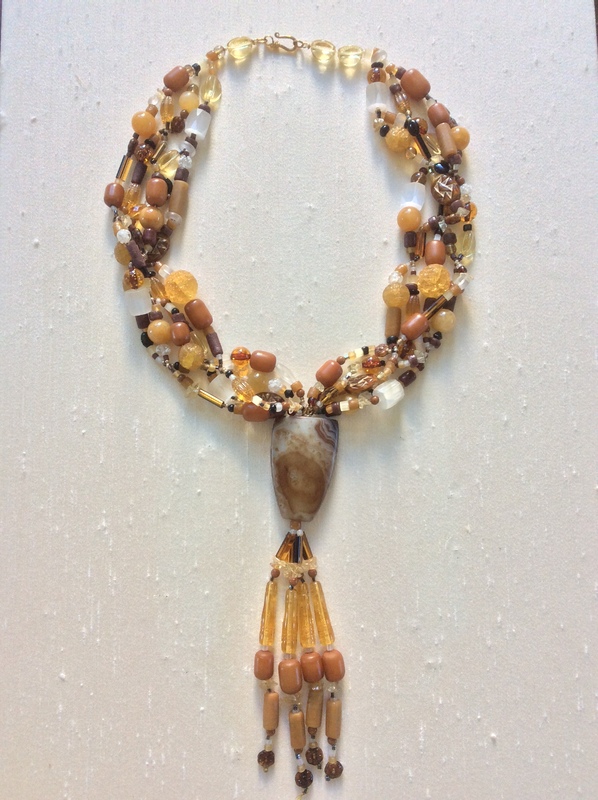 The stone centerpiece pictured here and above inspired this necklace’s colors: warm and inviting. 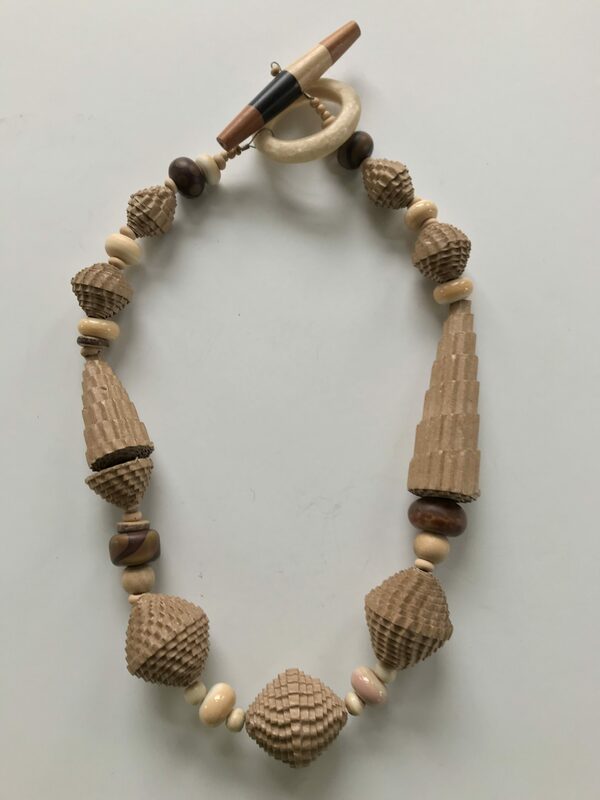 This is a woven necklace with four strands started at the bottom. The threads were pulled through the agate and then four threads were each loaded with beads, looped through a main bead, knotted, and so on, up each side. The clasp is vermeil (14k gold over sterling silver). 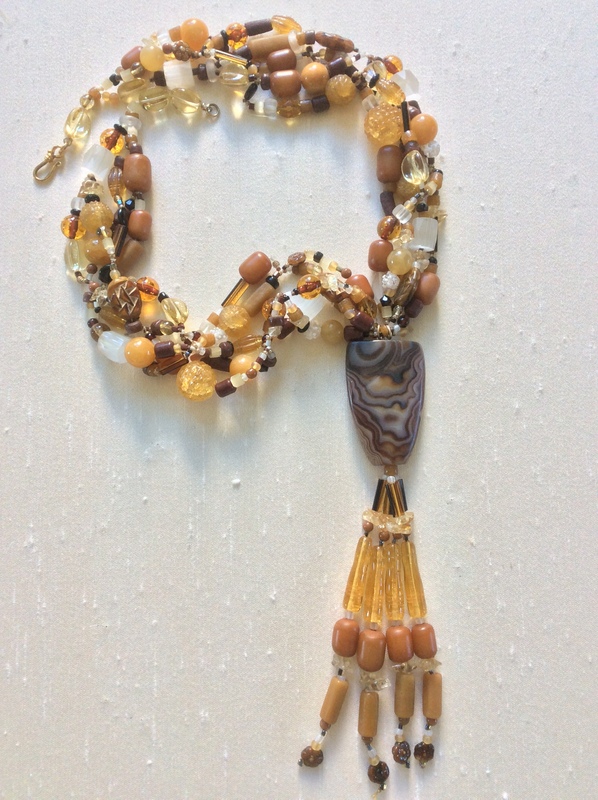 Here is a list of my favorite beads in the necklace: yellow and white “sugar beads”, my name, called crackle glass by other beaders; copal, opaque and beigey, which I have often described as young amber; white vintage Japanese cut glass; small white-striped Venetian trade beads; semi-precious citrine chips; yellow jade; pale yellow vintage pre-war German pressed glass (three are seen at the clasp). This necklace measures 21″ plus 7″ for the centerpiece and dangles. It weighs 6.8 ounces. It is not heavy to me since it is dispersed over 4 strands. Wear your own gold earrings with it. $145. 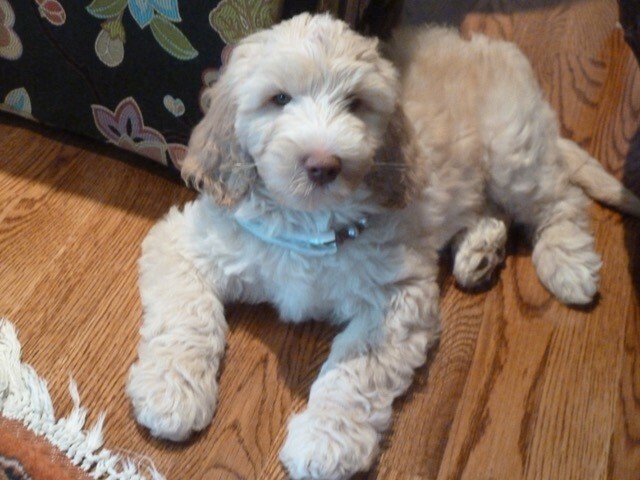 Here is Max, the Labradoodle, now 19 weeks old. Still a pesky puppy, but doing well in obedience classes. He is showing loving traits, follows me everywhere, and loves being outside! I wanted this month’s featured necklace to have a short story because I have a longer story I am eager to share. 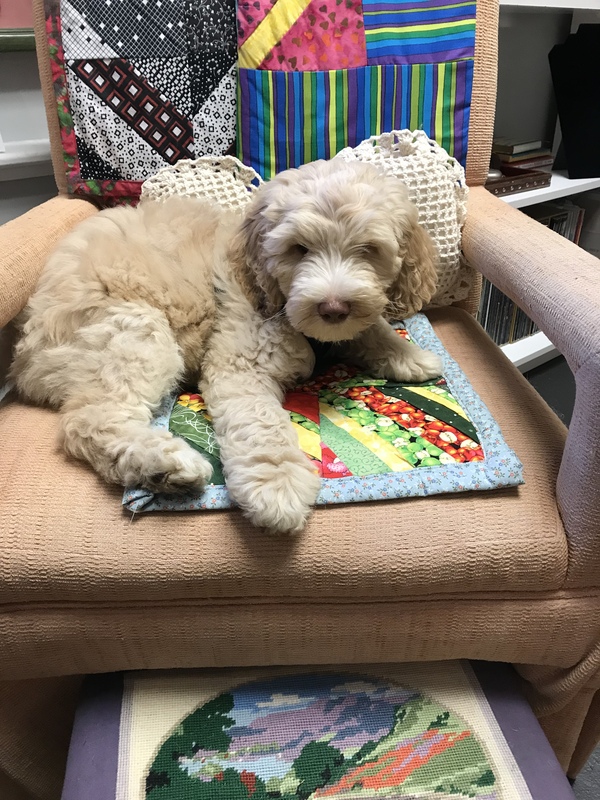 Max is the feature this month: a Labradoodle born on April 12, 2018 and welcomed into my home on June 19. Yellow Lab Maxie passed away on February 3 and it didn’t take me long to realize I missed my canine companion and I hated the quiet house! 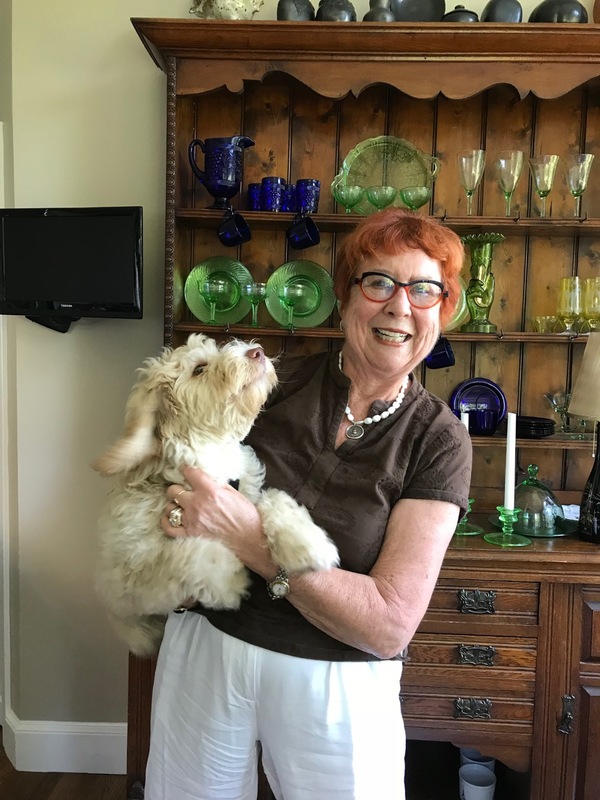 To fix it, I did a lot of research and found an experienced certified breeder: Marianne Hannagan at Autumn Haze Labradoodles in Newmarket, NH. The result is an 11-lb cream-colored mellow male puppy who should be 30 lbs at maturity. He is quite delightful even though he exhausted me the first week! Week two is an improvement as we adapt to each other. We have started Obedience Training. He now sleeps in his crate, assembledlast week by my brother-in-law, and already loves it! 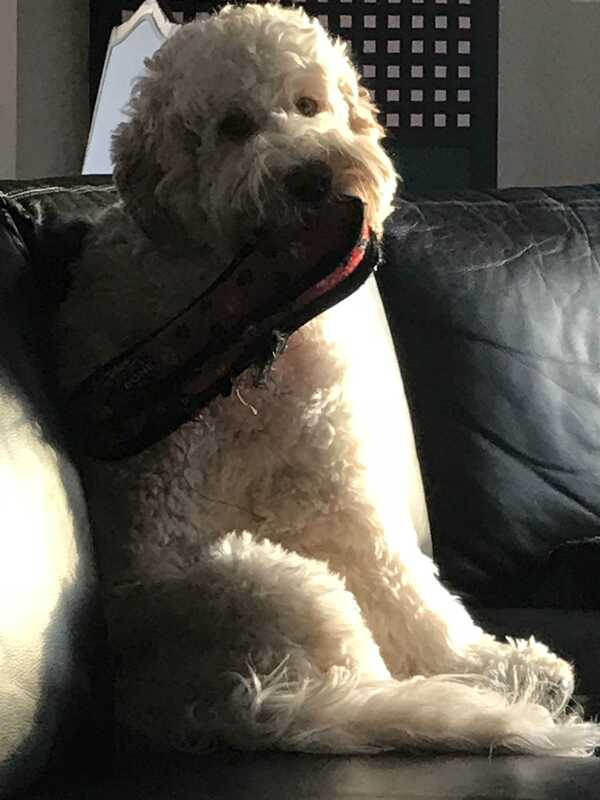 He walks into it often. Amazing. He is full of puppy energy. I think he turns on a go button and runs for60 minutes, then switches the off button and sleeps for more than an hour. Since I’m getting up at 6am, I try to outsmart him by taking him to the garden where I cut, deadhead and weed while he runs up, down and around. Then at 7, it’s food, coffee and the newspaper while he cools down and sleeps. For the rest of the day, it is all about Max outsmarting me as I follow him around, removing low-hanging stuff, re-arranging electrical cords and putting my belongings up high. Max was in the studio with me as I made this month’s necklace. It is sweet and quiet, even though it looks so shiny in the photo. 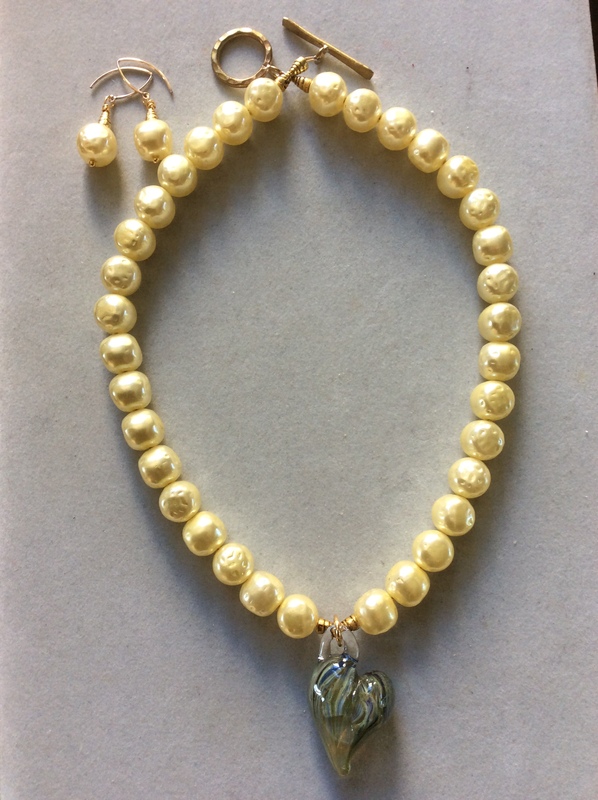 It is made with faux pearls which have no background story, in a pleasant pale yellow. The lampwork glass heart is made by Louise Erskine (MA) and is pale yellow at its center surrounded by several shades of soft green. 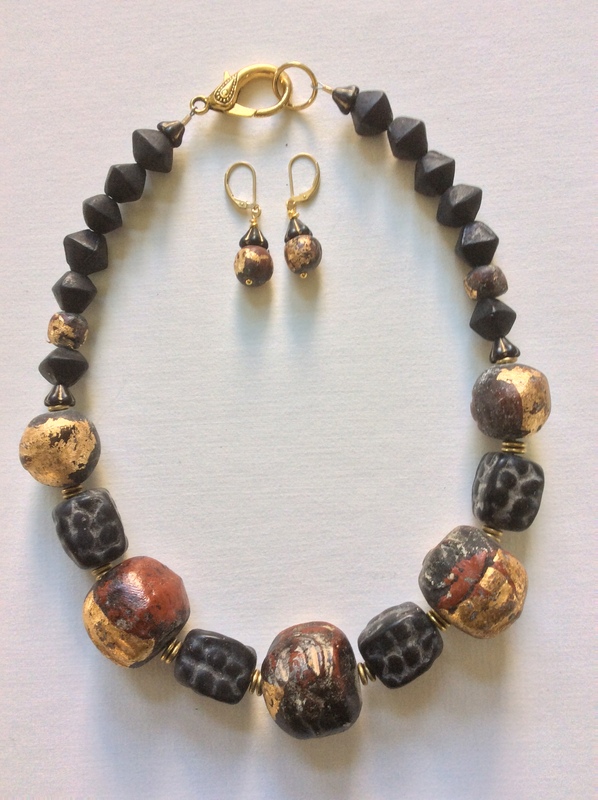 This necklace is 19” long; the centerpiece is 1.5″ long; the clasp is brass; matching earrings with vermeil earwires are included. $79. This amber is Baltic, and it is often called the real amber. 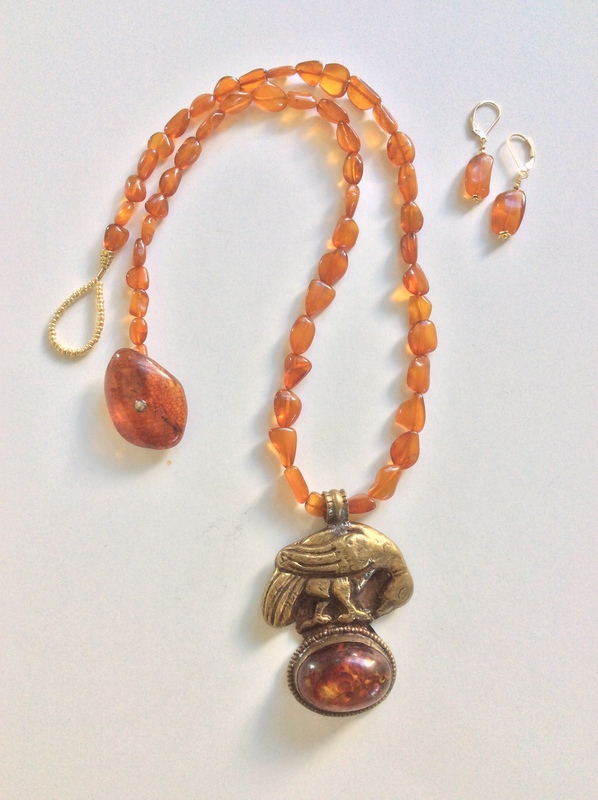 There are other ambers from other places, but Baltic amber is the most available. Amber is fossilized tree resin—not sap which circulates through a tree’s vascular system—but resin which is secreted through canals in the epithelial cells of a pine tree. The real delight of amber is when bugs and plant material are captured in its resin and fossilize inside the amber. The thrill of amber is that these pieces could be 40 million years old. Tibetan centerpieces are my most favorite to collect. 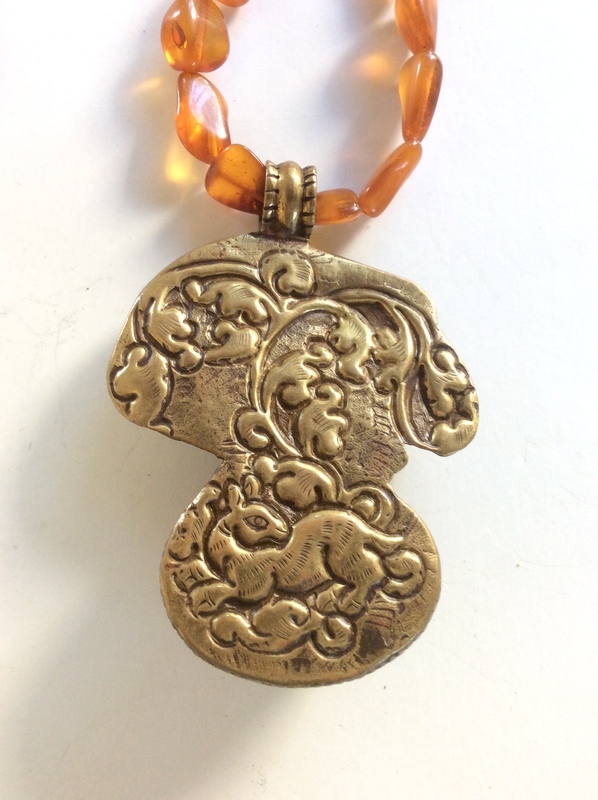 They always feature a large-sized stone bezeled onto a piece of silver or bronze which is richly engraved and decorated with a classic Asian animal. When I choose a Tibetan piece for a necklace, I invariably use matching beads strung fairly simply. And I try to find a creative clasp solution for the back of the necklace. 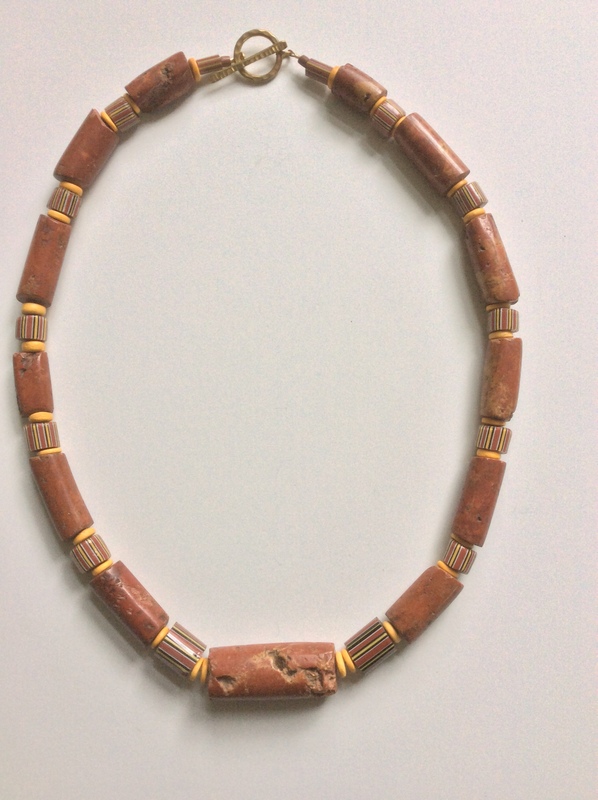 This necklace follows the pattern described above. The centerpiece amber has interesting if indistinct inclusions. The animal featured above it is a goose which the Asian culture loves because a migratory bird never fails to return. They also mate for life. Both themes signify longevity and constancy. Notice also on the back of the centerpiece the image of a deer, much beloved in Tibetan Buddhism as well as in Tibetan folklore and legends based on themes of longevity. I love how the deer is resting on a regal floral vine beautifully carved in brass. 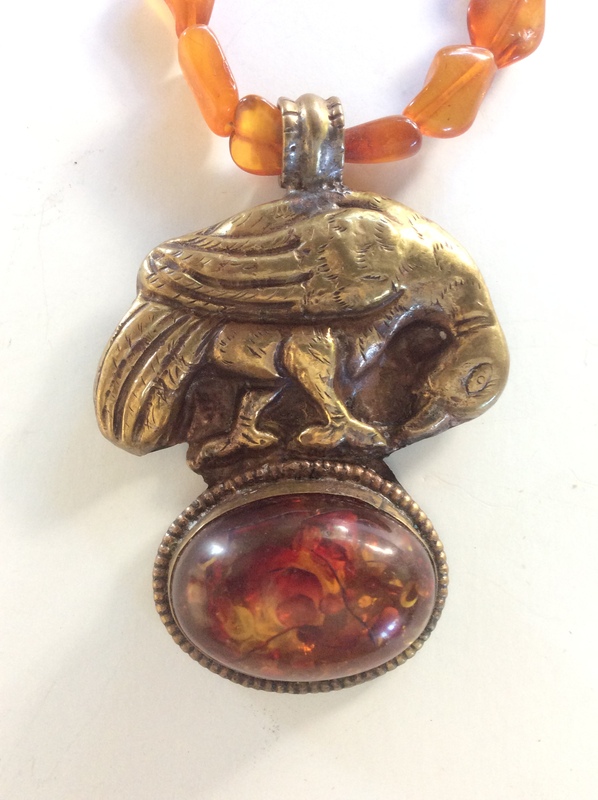 From the philosophical grounding of longevity themes, lift your eyes, dear reader, to the whimsical background of the clasp: in its prior life in the 1960’s, this chunk of amber was a cufflink! My friend Betty gave me a bag of broken and out-of-favor jewelry (I love it when friends do that!) with several amber cufflinks I treasured. Here it is, upcycled! Check out the inclusions. 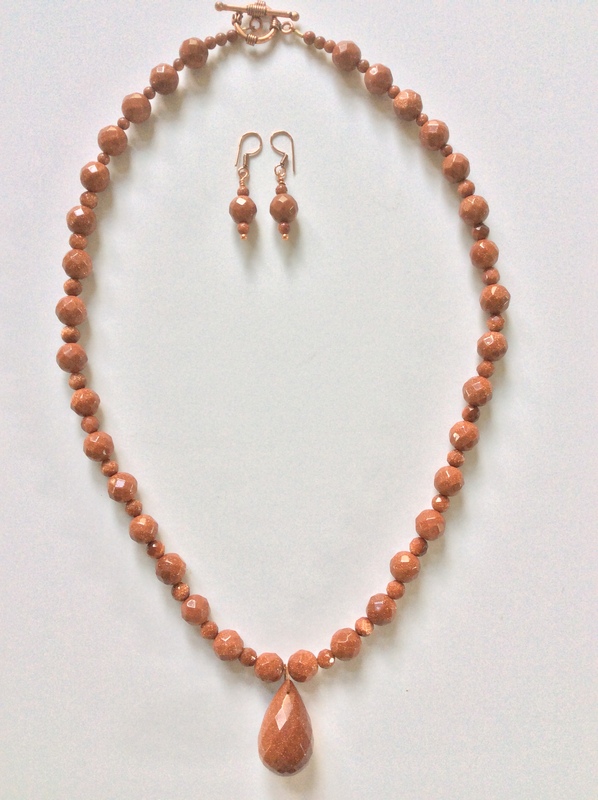 This necklace is 24” long; the centerpiece is 2.5” long; matching earrings are included. $99.